For a time now I have been struggling to work with those kinds of beads that are longer than they are wide, with a hole at one end. Yes, I mean drop beads and their variations. These are designed to work in a flexible, drapy design, under the influence of gravity, so that they will point down! Of course I don’t want to use them like this! I want them to stick up, or stick out at a jaunty angle!! There lies the problem. How can I anchor them so that they stay robustly in place. It must be something to do with tension, and design. 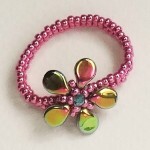 I recently came across the new ‘Pip’ beads which are of this shape. I wanted to make them into a very minimal flower design, (that’s what they wanted to be made into! ), which has the least number of seed beads included. When using design to stop the waggle, one solution would be to create a fitted socket to pull the bead into, so that it can’t move in any direction. This approach would involve quite a bit of building up, so I looked for a tension based solution. It turns out that using brick stitch in the round is an answer to the problem. Because of the way that you pick up the thread bridge, rather than stitching through the bead, in brick stitch. You increase the tension in the thread through the pip beads, by drawing it into the centre. 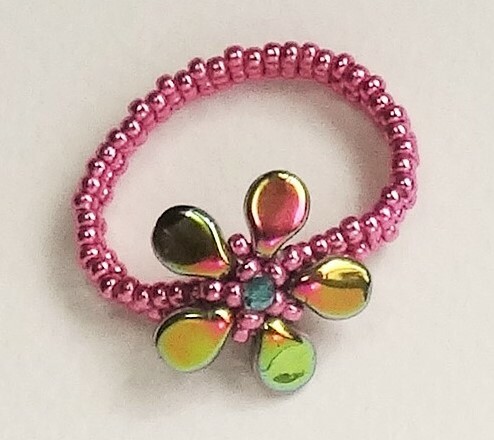 This holds them nice and securely, and just 15 seed beads in the final individual flower design! Finished off with a tiny crystal in the middle to cover the threads. Now I just need to try this with daggers, rizo, petal and button beads! !